The World-Wide Developer Conference is an event for developers. It is not a trade show and it is not a consumer show or an enterprise show for salespeople. Except for the keynote, all events are subject to Non-disclosure Agreements so it’s not even an event whose proceedings can be discussed openly. It’s also expensive. Registration is at least $1,500. Attendants are there to learn and ask detailed questions about development. It’s not for deal making. People not familiar with development would not be well served by the event. Registrations are therefore somewhat limited to about 5000. After the iPhone SDK was launched, the WWDC took on a new dimension. It became a mobile development event. As a result, 2008 was the first year when WWDC sold out. Attendance tripled over the Mac-only event the previous year. Every year since, not only has WWDC sold out but it has sold out quicker every time. 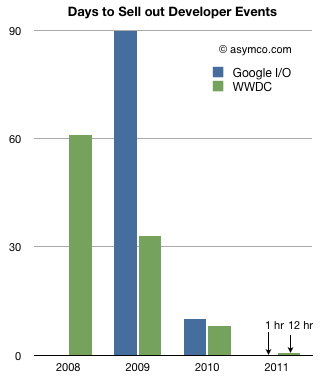 The following chart shows the days it took to sell out WWDC. I also added Google I/O data for comparison. In the era of the iPhone, the limited resource of attendant seats has always been exhausted at accelerated rates: from 60 days in 2008 to 0.5 days in 2011. A similar pattern emerged for the Android event. What should be noted is that these events are focused on post-PC development. Clearly the increased interest among developers is for the mobile side of the business. Developers certainly seem to sense the way the wind is blowing. They are, as humans, prone to over-confidence but they are also often accused of being hard to please. The most common lament among new platform builders is “How do we attract developers?” The platforms showcased here had no trouble attracting developers in the tens of thousands three years after being launched. The Post-PC era is evident in all kinds of data. This set (developer attendance to mobile development) is particularly stark. It’s a proxy for investment and IT interest. There is a non-linear nature to this growth and history shows that non-linearity leads to unpredictable or unforeseeable change. WWDC still has Mac OS X tracks but that track was there pre-2008 and did not sell out the event. Microsoft hosts several developer events (PDC, MIX, and Tech·Ed) some of which also sell out, but they have a far wider focus. › Next Post The controversy of playing it safe: What's IDC's Smartphone Market Message?